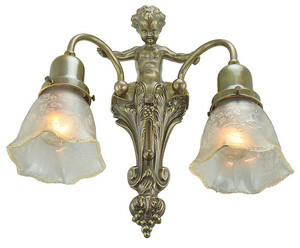 Double arm wall sconce cast in solid brass, and wired with two sockets capable of a full 100 watts each. Very nice ambiance for a classical room. In addition to brightening a dining or living room wall, these are lovely as bathroom over-the-sink sconces, or an alternative to a lamp either side of the bed. The design would have been popular from the late 1890's, through the 1930's. Backplate: 4 ½" wide x 13 ½" tall. Projection: 7" from the wall into the room. Wattage: Wired to UL standards, with two sockets rated for up to 100 watts each. For an energy saving idea, please check out our LED Bulbs. Glass shades are sold separately. Fitters are for 2 ¼" glass shades, and we have many to choose from. 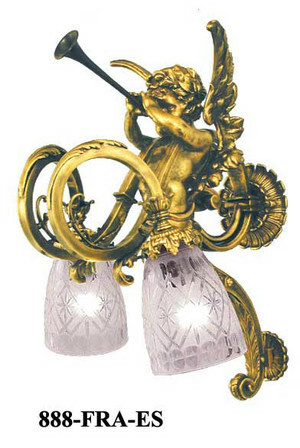 We picture 040G, our cupid or angel glass shade, as a suggestion. If you like the fixture as it is shown in the picture, we have included an option to purchase the sconce with the shades in the menu above. 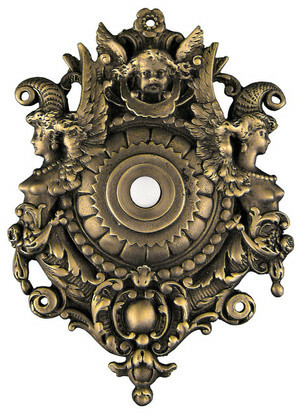 Sconce includes an old fashioned, rotary style On/Off switch, located towards the bottom of the backplate. 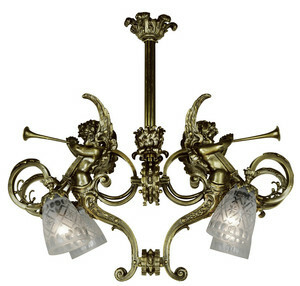 We offer a number of light fixtures that would complement this sconce. 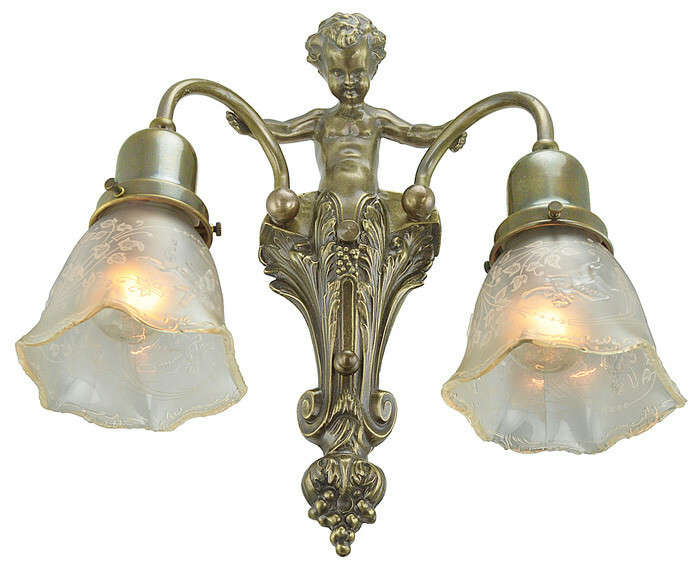 Our cherub newel post light started as a gaslight fixture, but was so popular it was converted to electric in turn of the century homes. 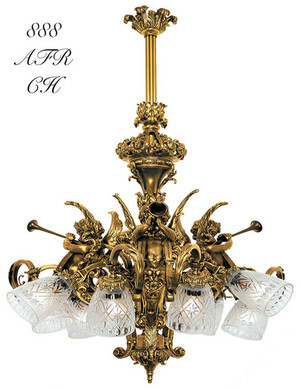 One of only two French fixtures we've reproduced is the cherub chandelier. A matching sconce is available. 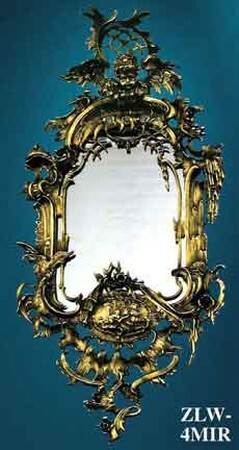 A delightfully detailed rococo hall mirror is cast in bronze. 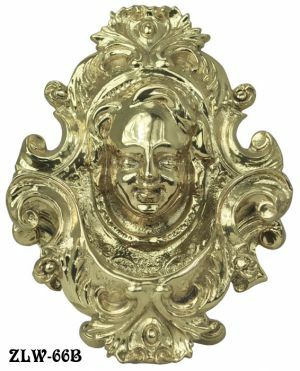 In addition, check out our charming cherub doorbell.